Southern Skywatch July, 2016 edition is now out! Evening sky on July 9 looking west as seen from Adelaide at 9:00 pm ACST. The radiant of the eta Aquariid meteor shower is shown. Similar views will be seen throughout Australia at equivalent local times. (click to embiggen). The July edition of Southern Skywatch is up. 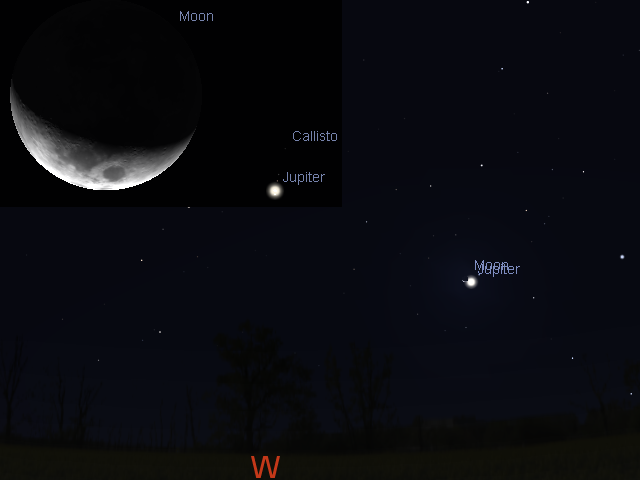 This month sees all five bright planets in the evening sky and still more nice planetary action. Jupiter and Mars and Saturn are prominent in the evening sky. Venus and Mercury return to the evening sky late in the month. Mars, Antares and Saturn form a triangle in the evening skies. Jupiter is very close to the waxing Moon on the 9th. Mars Between 1 and 5 July Mars is within binocular distance of the faint globular cluster NGC 5897. On the 15th, the Moon, Mars, Antares and Saturn form a diamond in the sky. Saturn has a close encounter with the Moon. Venus is returns to the evening twilight and is close to Mercury on the 17th. Mercury, enters the evening sky late in the month and is close to the bright star Regulus on the 30th and 31st, forming a line-up with Venus and Jupiter.